I still remember the day my dad brought a chubby little baby to me at the hospital, and told me that she was my sister! My parents had been getting me ready to welcome a baby girl for months, but it all got so real when she was in my lap. I didn’t know what to think of this baby with big brown eyes and no hair! For some reason, the moment she was in my lap she started crying on the top her lungs. I was sold on the idea of a beautiful, happy little baby sister. I was so upset with her crying that I started crying hysterically too. 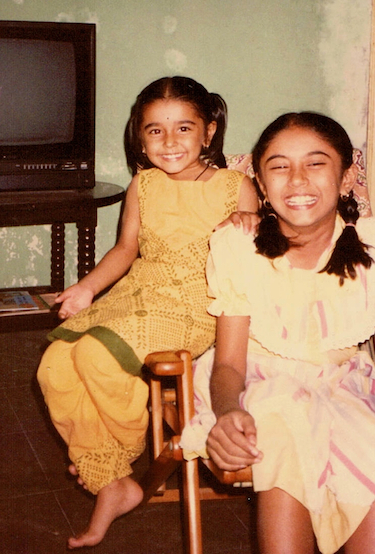 My little sister, Lopa, is all grown up and we are celebrating her birthday today! Ice cream has been one of her absolute favorites ever since she was a baby! In the picture below, I was trying to take her ice cream cone away from her so we could both pose for a picture. Do you see how annoyed I was and how adamant she was? There are so many fond memories that come to mind when I think of her – saving up the little money we got from mom to buy ice cream once a month, or turning on the radio really loud and dancing our hearts out! I am so proud of her for the independent, confident person she has become. 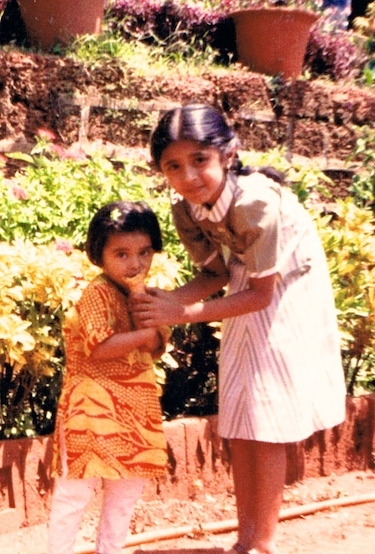 While growing up, Lopa has been my partner in crime, keeper of my secrets and the shoulder to cry on! She has been one of those “stable” individuals I could go to with all my problems, and invariably she made those problems her own and helped me through them. Of course, like all siblings we had our ups and downs, especially when we were younger. She always looked up to me, and wanted to play with me. But I had five years on her, so many times I thought I was too cool to hang out with her! One evening, we were at Kamatibaug, a local park in my town in India. I was supposed to keep an eye on her, but I was too busy playing with my friends. When I finally looked up to see where she was, I couldn’t find her anywhere. I still remember that sinking feeling of total loss. I had to go to my parents and tell them I had lost her, how was I supposed to do that? And then I saw her in her red dress – walking with an elderly gentleman who was trying to find her parents! In those frantic moments, I realized how much I truly loved her! Sometimes, we have to come so close to losing someone or something to realize how fortunate we are to have what we have! I have experienced that feeling of separation from Lopa a few times – dropping her off at her hostel when she started studying in a different town, or saying goodbye at the airport when I was leaving India for the first time. Now that Lopa and I live in different countries, we only get to visit each other every couple of years and I cherish every moment I get to be with her! As the holidays kick off the big shopping spree shifting the focus on the new, lets all remind ourselves to first cherish the old friends and relationships. Lets be grateful for our health and our loved ones! 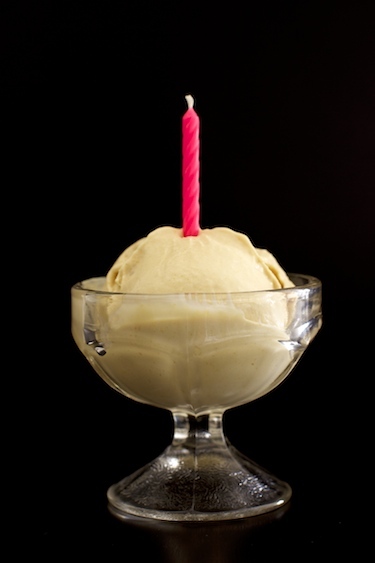 To celebrate my little sister’s birthday, I have made her favorite – ice cream. 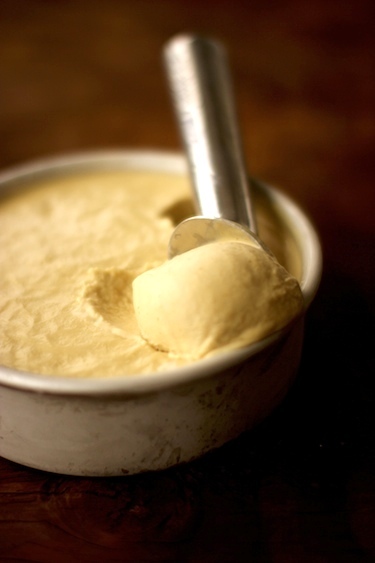 This dairy free ice cream is easy to make and is surprisingly nutritious! 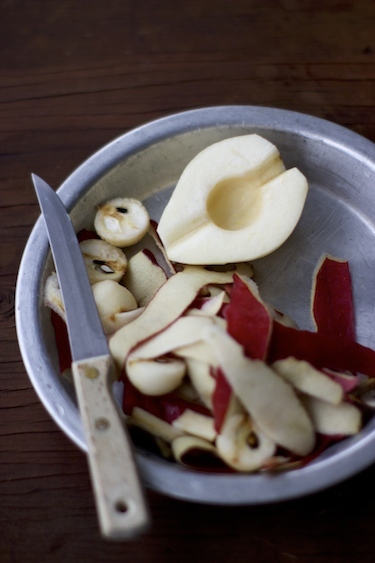 Peel pears, cut in half, remove core and bottom with pairing knife. Combine water, white wine, honey, saffron, cardamom powder and salt in medium saucepan. Bring to simmer and add pears. Add more water if pears are not completely submerged in liquid. Cook on medium heat for 45 minutes to 1 hour until pears are soft. Carefully take pears out with a spoon. Boil poaching liquid until it reduces to 3/4 cup, about 15 minutes. Let the liquid cool down completely. Place 2 cans of coconut milk and poaching liquid to the saucepan and bring it to simmer. Simmer until the mixture reduces and coats the back of the spoon, about 35 minutes. Taste and adjust sweetness with honey. Cool down the mixture completely. Refrigerate remaining coconut milk can for at least 4 hours or overnight to separate coconut cream from water. Open the can and carefully scoop out coconut cream solids from the top. 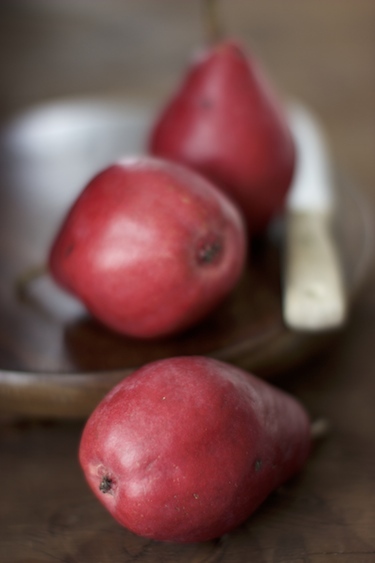 Put the cream in a blender and add poached pears and reduced coconut milk mixture. Blend well. 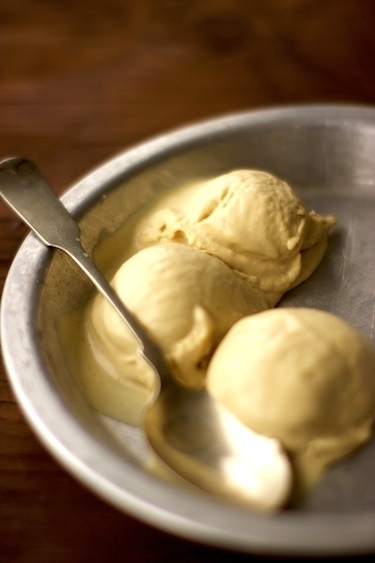 Freeze until desired consistency or add mixture to your ice cream maker and churn according to instructions. Inspiring, healthy recipes with artistic presentation. I made the pumpkin soup with panna cotta and served it to my son and soon to be daughter-in-law/chef to much acclaim! Thank you Harriet! I am so happy you tried the recipe, and even happier that a chef enjoyed the dish! Thats the best gift I have ever got! You are my best buddy. Very proud to be your sister. Aaah the ice creammmmm is the best Lots of love and hugs..
what a tribute to you sister! happy birthday to her. i like the addition of the wine, is it to keep the ice cream from getting too icicle-y? Thanks Lan, I added wine as acid base to balance the sweetness of honey & pears in poaching liquid. You can also add little lemon juice instead of wine – I like little complex flavour of wine instead of lemon juice. I just got an ice cream maker for Christmas so I will definitely try this out! what a heart felt post to your sister i have a younger brother who is 4 years younger than me and its the best gift in my life. 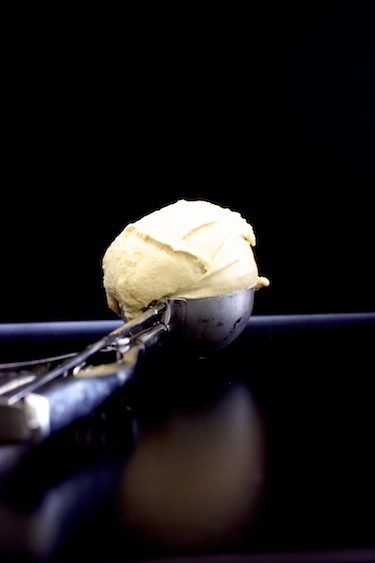 Lovely take on icecream and gorgeous shots. Medha, this is such a lovely post…your pictures with Lopa are so sweet . I have an older sister and I thank God for her every single day…..sisters are just the best , older sisters specially so! Oh my gosh, Lopa resembles my little sister (in the second pic). I feel nostalgic reading this post. It is ironic that we fought when we were living together and how much I miss her being thousands of miles away now. I am blessed to have her as my little Sis. I am sure your sis will relish this ice-cream. Happy Birthday Lopa. Wishing you a wonderful year ahead. Thanks for stopping by Shayma. I am a fan of your work!